This is one of the best salads to make when the corn is really fresh. The easiest way to cook the corn is in the microwave. Cut off one end, microwave for 4 minutes, remove with hot pad – shake the corn out of the husk. (Tip: All of the silks should remain in the husk while cooking and you have perfectly cooked corn.) Even though the basil will get a little dark, this salad gets better the next day. Cook the green beans in salted water until just done – do not overcook. Chill well (approximately 15-30 minutes). 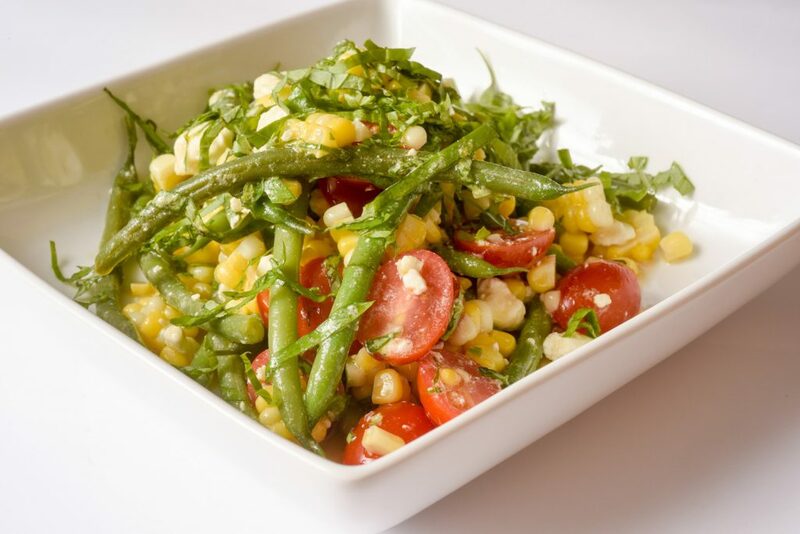 In a large bowl, combine the cherry tomatoes, corn, and green beans. Add cheese to the vegetable mixture. Make the vinaigrette by combining the vinegar and mustard then add the oil in a thin stream while beating. Add the dressing to the vegetable mixture. please let me know if you have recipes that serve fewer people. Most of the Med Instead of Med recipes serve 2-4 people. You can cut many of the recipes in half for a smaller amount. However, you may want to make the whole recipe so you have planned overs for another night or for lunch.